A transient designer plugin can sometimes be more precise than a compressor or limiter. 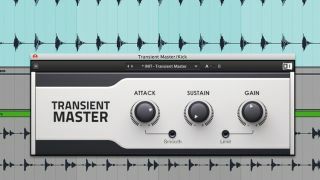 Transient designer plugins provide an efficient method of shaping the amplitude response of a signal in a way that's often more clean, simple and precise than more traditional compressor or limiter devices. Here, we're going to shape the attack and sustain characteristics of a kick and snare in a modern drum mix. As is the case with any dynamics processing, you should always re-adjust your final output level to match your unprocessed signal's loudness, as it's easy for gain increases to fool you into thinking a particular plugin is making things sound better. You'll notice that we've used our plugins' gain controls to do just this. Step 1: Here we've got a 121bpm house beat consisting of a 4/4 kick drum, percussion loop, and snare on beats 2 and 4. It's clear this drum mix can be improved - our kick is dull and excessively lengthy, while the snare has an overly-prominent attack and little sustain. Step 2: We initially mute our snare so we can focus on the dynamics of our kick drum, which is lacking front-end snap. Its boomy tail will also pose some low-end problems when we add a weighty sub bass part to our track later. Step 3: We load NI's Transient Master across the kick and increase the attack to around 50%, pushing the front-end crack of the kick forward in the mix. Turning the sustain down to minimum also shortens its length. However, we've now pushed up some boxy mid-range frequencies. Step 4: An EQ notch at 130Hz carves away this honky characteristic, and we're now left with a tighter, punchier kick drum that cuts through the mix whilst leaving more room between each beat for a deep and powerful bassline to be added later. Step 5: We can now unmute our snare and compare it with the other drum elements. Its excessive snap and lack of body are even more apparent against our newly-shaped kick drum. Instead of discarding it for a new sample, we can apply some simple transient processing once more. Step 6: A fresh Transient Master simultaneously pulls down the snare's initial peak and pushes up its sustain, bringing out the body of the hit whilst reducing its spikiness against our kick. The plugin's gain dial is turned up to re-level the sound in the mix.